With the wearable solution for the Honeywell Dolphin 70e/75e you make users even more flexible than before. Attach the mobile computer comfortably to your arm and suddenly additional areas of usage are possible, such as warehousing and pick-by-voice. Additionally, you easily connect a 1D or 2D ring scanner via cable or Bluetooth, to also increase data capture options. The combination of the Dolphin 70e/75e, wristband and scanner together weigh less than 500 g, light enough even for longer operation times. 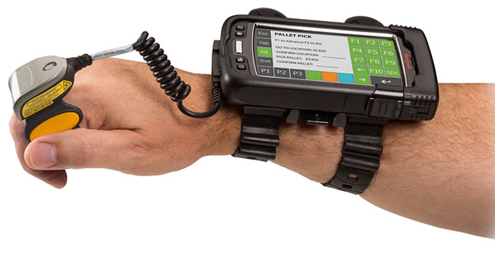 Equipped with a 2.26 GHz processor, 2 GB RAM and 16 GB Flash memory, the Dolphin 75e Wearable provides the right base for nearly every application and comprehensive data capture. The MDC scores highly with a 4.3" WVGA color display (480 x 800) with capacitive touch. Wi-Fi (802.11 a/b/g/n/ac) and Bluetooth guarantee highly reliable wireless data transfer. Certified according to IP67 standards, the Dolphin 75e is well suited for usage in rugged environments and in demanding production plants.